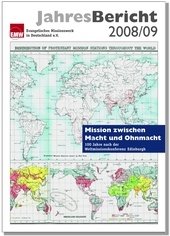 EMW, The Association of Protestant Churches and Missions in Germany worked on the topic of 'Mission and power' in 2008-2009. By kind permission of EMW, its 2008-2009 yearbook, 'Mission between Power and Powerlessness' (in German), is available for download here. Member bodies of EMW met in Freudenstadt, Germany on 8-10 September 2009 to discuss 'Mission between power and powerlessness' in anticipation of Edinburgh 2010. Their deliberations were faciliated by Rev. Jacques Matthey, Director of World Council of Churches Programme 2 on 'Unity, Mission, Evangelism and Spirituality', Dr Daryl Balia, International Director, Edinburgh 2010, and Dr Michael Biehl of the Missions Acadamy, Hamburg, among others. Further information in German about the event is available for download (pdf file) here. By kind permission of EMW and the author, the keynote address 'Mission und Macht' (Mission and power) by Rev. Jacques Matthey is available for download here. For further information about EMW's work towards 2010, visit the website.